On October 16, ALIGN and 30 other partners from throughout New York City and State sent a strong message to our elected officials: stop rolling out the red carpet for Amazon. As Amazon expands its presence in New York and considers locating its second headquarters here, New York officials must not offer corporate welfare to a multi-billion dollar company at a time when working families are struggling to survive and investments in public infrastructure are so badly needed. Any deals made with Amazon must be accompanied with the highest community and labor standards. We unveiled letters to Governor Cuomo and Mayor de Blasio at a press conference on the steps of City Hall. ALIGN is also a signatory to an open-letter to Amazon CEO Jeff Bezos, signed by over 110 organizations across the U.S. and coordinated by the Partnership for Working Families (of which ALIGN is a New York affiliate). Amazon has a “wish-list” for the city that will host its next headquarters. In counterpoint, our letter sets out a wish-list for Amazon, calling for good jobs, community benefits, transparency and accountability. Meanwhile, almost two thousand workers from another corporate behemoth – Spectrum – are in their eighth month of strike, calling for decent health care, pay and pensions. In an op-ed, “Monopolizing the Big Apple,” Maritza writes that both Amazon and Spectrum epitomize a corporate race to the bottom for workers and communities. Building a movement for a healthy environment, fair economy and racial equity requires a strong foundation built on power. ALIGN is establishing this foundation by strengthening the bonds of trust between rank and file members from our partner labor and community organizations. 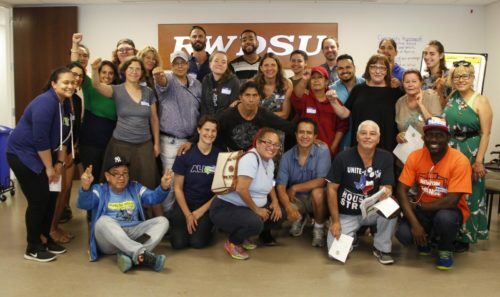 Our School of Active Resistance (SOAR) brings workers and community members together to share experiences, deepen relationships, conduct joint political education, strengthen skills, and identify practical ways to take action for progress in our city. On September 16, we held the Citywide Climate Activists Training with members of many organizations. Partners represented at the training included International Brotherhood of Electrical Workers (IBEW) Local 3, Ironworkers, Make the Road New York, New York Communities for Change and New York City Environmental Justice Alliance (NYC-EJA). Watch a short video from the training: This is what building a movement looks like! New York’s transit infrastructure is broken, and low-income communities of color bear the brunt. They are disproportionately more likely to use public transit and endure the financial consequences of lost work and wages when the system fails. Furthermore, they also live near the areas where traffic congestion is the highest, and suffer the health risks to their communities from the exposure to toxic fumes and congestion waste. 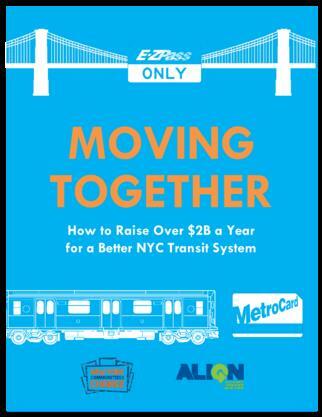 Allocate some of the revenue raised to fund reduced-fare Metrocards for the city’s 800,000 residents living below the poverty line. The recent hurricanes in Puerto Rico, Florida and Texas provide stark evidence of the devastating impacts of climate change. 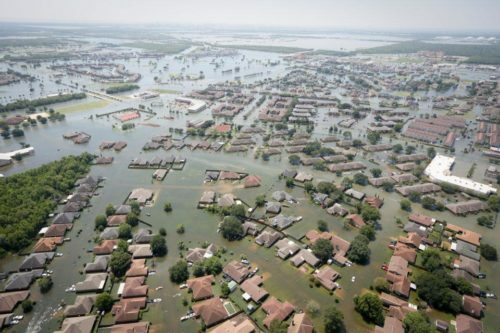 They remind us that low income communities of color are the hardest hit by climate catastrophes. Maritza notes in an article for Alternet that the rebuilding dollars in the wake of these storms must be invested in career-oriented jobs for low-income residents, more affordable housing, and major infrastructure upgrades, all in ways that reduce our reliance on an extractive economy and that curb emissions harmful to our environment. ALIGN is sharing lessons with organizations in other parts of the country, drawing on the experience of the Alliance for a Just Rebuilding (AJR) here in New York. AJR’s work led to the precedent-setting Sandy Build It Back program. Build It Back created local hiring and apprenticeship programs for workers from storm-devastated neighborhoods to rebuild over 10,000 hurricane-damaged homes for New Yorkers in the wake of Superstorm Sandy. Five years after Sandy’s landfall New York City must still take huge strides in order to reduce its carbon footprint and eliminate economic and racial inequities. 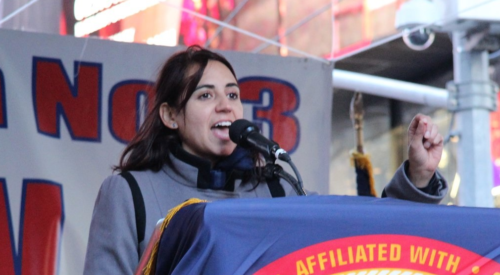 ALIGN and our partners from across the city rallied on the fifth anniversary of Sandy with specific demands for Mayor de Blasio, Governor Cuomo, and Senator Schumer. Buildings contribute close to 70% of New York City’s carbon emissions. In September, Mayor de Blasio announced a proposal that the city will mandate big buildings to reduce the use of fossil fuels, and Council Member Costa Constantinides introduced a complimentary piece of legislation. While this is a step in the right direction, it is not nearly enough. In October, ALIGN’s Climate Works for All coalition rallied at City Hall to release the coalition’s plan to reduce greenhouse emissions with whole building retrofits. Our plan covers electricity and steam as well as on-site use of fossil fuels, while creating over 4,000 jobs and protecting affordable housing tenants from rent hikes. 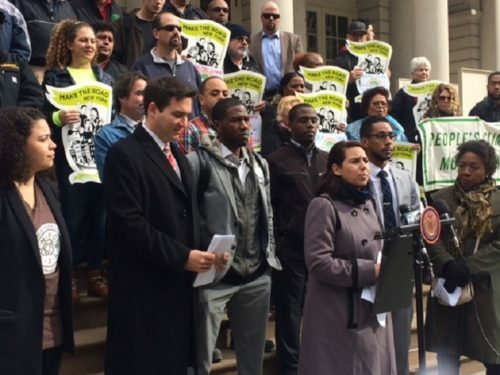 Members of the City Council’s Progressive Caucus, which endorses and supports our proposal, joined the coalition on the steps of city hall to ensure that bold legislative action is taken. The coalition continues to create grassroots support calling on Council Member Constantinides to pass a bill with these bottom-line requirements. New York City will only fulfill its ambitious climate goals of reducing greenhouse gas emissions 80% by 2050 and demonstrate its climate leadership to the world if it takes the bolder path. Meanwhile we have continued our advocacy to create an equitable transition to renewable energy. ALIGN and partners have urged New York City Department of Citywide Administrative Services (DCAS) to make sure that solar installation on an initial 88 rooftops of public schools and libraries (towards New York City’s goal of installing 100 MW of solar energy on public buildings by 2025) adheres to criteria that prioritizes environmental justice communities across New York City as primary beneficiaries. The result has been an RFP issued for buildings in Sandy-affected neighborhoods, zones where the energy grid is susceptible to long-term or frequent outages and low-income, frontline communities. This work is all in the realm of a public project, ensuring the use of a Project Labor Agreement which includes high-road labor standards and local hiring requirements. ALIGN and partners continue to meet with DCAS to ensure that future projects address labor and equity concerns. The NYRenews coalition, in which ALIGN is a steering committee member, is rolling out its most ambitious platform yet. We are working to set into law New York State’s clean energy goals, to introduce “polluter penalty” legislation, and thereby ensure adequate resources get to frontline communities. This legislation will make polluters pay for the damage they are doing to our climate and communities. The revenue generated from these fines will allow the state to invest in renewable energy, provide grant funding for disadvantaged communities and workers, and create energy rebates for low-income New Yorkers. In August, ALIGN hosted a roundtable that engaged eight Building Trades labor affiliates with a policy overview of NY Renews’ renewable energy and carbon pricing policies. The roundtable concluded with a productive discussion on the potential impacts of the bill, and the elements that the coalition’s policy proposals will need to include in order to account for worker and job protections. NY Renews’ impact is beginning to have national resonance, inspiring the introduction of federal climate justice legislation in Washington, DC by Senators Bernie Sanders and Jeff Merkely, and gaining the attention and support of notable movement leaders such as Naomi Klein, Keith Ellison, and Ben Jealous among others. ALIGN continues to campaign through the Transform Don’t Trash NYC coalition for systemic reforms in NYC’s commercial waste system. This campaign represents the cross-section of issues that are at the core of ALIGN’s mission – environment, economy and equity. In the past few months we have launched the website “Trash Kingpins of New York City” which profiles abuses by the low-road carting companies, published new data that shows the city’s commercial recycling rate is still abysmally low, and worked with members of the congregation of Greater Allen AME cathedral in Jamaica, Queens, to document the high levels of truck traffic and air pollution near the waste transfer station in that neighborhood. The majority of workers in the commercial waste industry are immigrants. 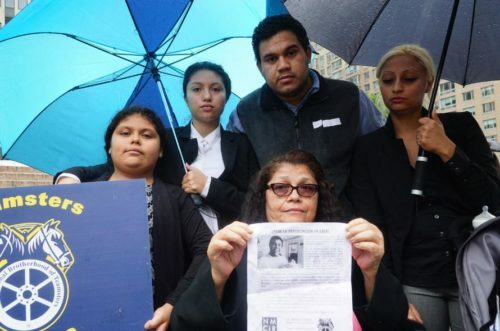 New York City waste workers face enormous dangers on the job, and workplace dangers are compounded for undocumented workers by increased threats of deportation due to their immigration status under the current federal administration. We joined Teamsters in protesting the detention and later deportation of sanitation worker Eber Garcia Vasquez, a Teamsters 813 member and worker at Stericycle in NYC for the past 26 years. Soon after, Teamsters Joint Council 16 made the important move of declaring itself a sanctuary union. We have also been a staunch supporter of the majority-immigrant workers at SIMs Municipal Recycling in their efforts to organize. We celebrated their victory when the workers organizing committee signed their first contract with Teamsters 210 in August. The Transform Don’t Trash-NYC campaign saw a significant victory when the city committed to introduce commercial waste zones. Now in its implementation phase, we are advocating for the system to be as strong as possible for workers, low-income communities of color who bear the brunt of the city’s waste processing, and the environment. 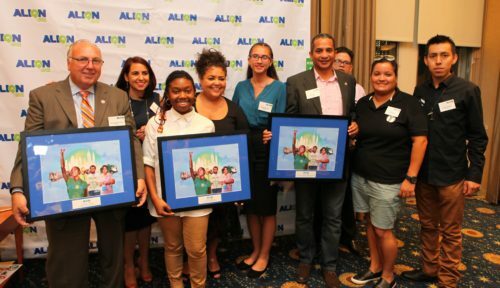 ALIGN’s Movement Builders Awards on September 26 was a powerful moment to celebrate leaders and to recognize ALIGN’s important role in building effective coalitions at the intersection of labor and community. We honored Christopher Erikson, business manager of International Brotherhood of Electrical Workers (IBEW) Local 3, the Teamsters Organizing Committee at SIMS Municipal Recycling, and Elizabeth Yeampierre of UPROSE.